FilRight Pro Carbon filament consists of a combination of PETG filament and 20% carbon fibers. This combination results in a unique 3D print material that is so strong and powerful that it is suitable for very high loads. What is the difference between PETG and Carbon filament? FilRight Pro Carbon filament is stiffer and has a more matte finish than ordinary PETG filament. For the 3D-printing of which parts is Carbon filament used mostly? Components for the automotive industry, drones and radio controlled vehicles can be printed with FilRight Pro Carbon filament. The desired printing temperature of Carbon filament varies between 225°C and 245°C. The use of a heatbed is required. The recommended heatbed temperature is between 35°C and 60°C. We recommend that you also use an adhesive for the print bed, such as, for example PrintaFix adhesive spray. This prevents any problems with the adhesion of 3D prints. Note: To print with FilRight Pro CARBON filament a nozzle with a minimum diameter of 0.4mm is required. 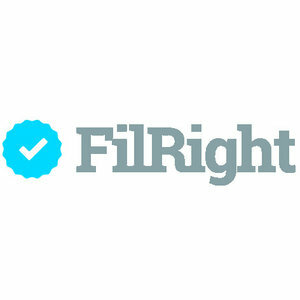 FilRight Pro Carbon Filament is available in both 1.75 and 2.85 mm diameters. Are you looking for other colors and spool sizes? Let us know. These are available on request in most cases. FilRight Pro Carbon filament is delivered on a 500 gram spool. Because this spool is transparent, you can see the current stock of this filament at any time and you are never unexpectedly without 3D printing material. In order to guarantee the quality of this product even after transport, the spool is completely sealed and packed in a specially designed cardboard box for FilRight, which is also well packaged. Would you like to know more about FilRight Pro Carbon filament? Then contact us.